Rubio rode the Tea Party wave back in 2010. At that time, the movement considered him their “Golden Boy” and future leader. That all changed once he arrived on Capitol Hill. 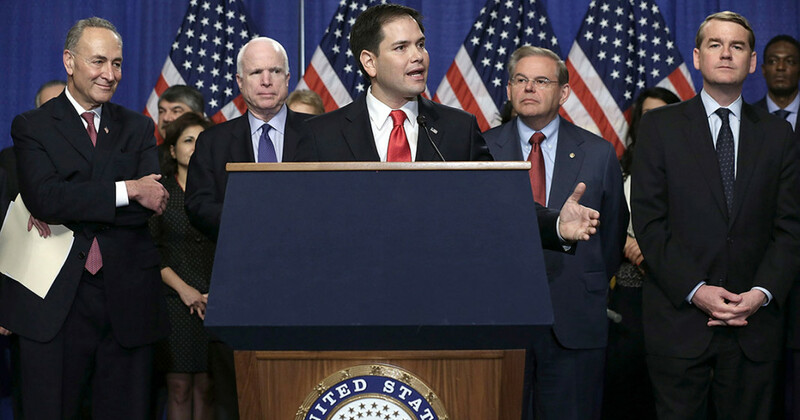 When, as part of the “Gang of Eight,” Rubio took a major role in drafting a bill giving 11 million illegal immigrants a path to citizenship, his early supporters were outraged. Of course, the corporate wing of the Republican Party lauded Rubio (no doubt, drooling over the prospect of an influx of cheap labor), but most conservatives in Congress rose up in anger and killed the legislation. After that, Rubio started to back away from his former position. Suddenly, he started calling for deportations before addressing the immigration issue. Rubio has been under attack from rival GOP candidate Ted Cruz for opposing increased border security and other measures, indirectly accusing him of “pushing [a] massive amnesty plan.” After that, Rubio declared that the borders mush be secured before addressing the issue of illegal immigrants – though he stopped short of calling for mass deportations like Trump and other GOP candidates. During the most recent GOP debate, Rand Paul took Rubio to task on the issue, accusing him of being “soft” on immigration – and therefore, “soft” on terrorism (newsflash, Rand – most terrorist acts in the U.S. have been committed by native-born or naturalized citizens). That’s the very definition of a career politician, which Rubio certainly is. Of course, what his critics call a move of political expedience is what Rubio calls “evolution” and “pragmatism.” The fact remains that his vague and changing position on the immigration issue has caused him to lose the trust of Tea Party voters, to whom he owes his political career. That alone makes Rubio’s nomination highly unlikely.